Norman Rockwell paintings inspired many scenes in “Moonrise Kingdom,” which stars Jason Schwartzman, Jared Gilman and Bruce Willis, and Kara Hayward. 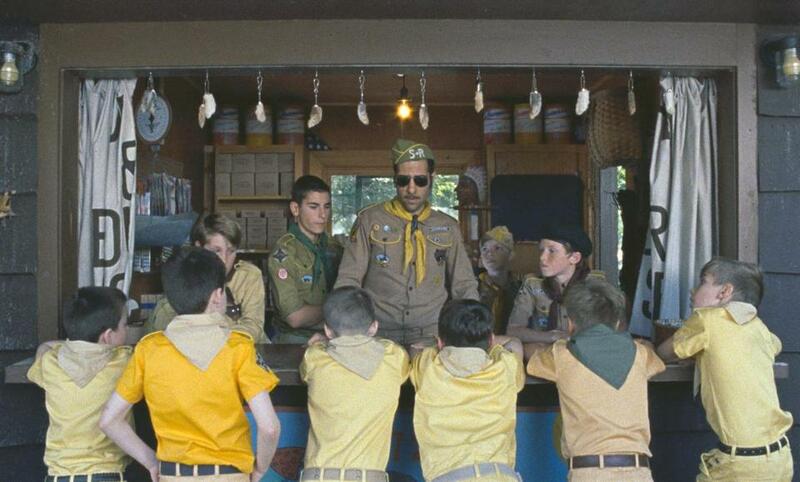 There are obvious stars in director Wes Anderson’s “Moonrise Kingdom”: Bill Murray as the cantankerous patriarch, Edward Norton as the earnest but scattered Khaki Scout leader, and a tightly wound Tilda Swinton as the terse child-welfare worker. But nearly stealing the movie out from under them — and the child actors who play the lovelorn pair that the film centers on — is Anderson’s halcyon kingdom of the fictitious New Penzance Island. It’s a beautifully fussy windswept universe that Anderson created with the film’s production designer, Adam Stockhausen. Anyone who ever spent a New England summer at a family “camp” — that catch-all word for a summer house — will immediately be brought back to childhood. That’s no small feat for a home interior that was a set created inside a deserted Linens ’n’ Things. The exact location of the New England island is never identified (the movie was filmed in Rhode Island last spring), but Anderson had a clear vision of what the imaginary world should look like. The movie, set in 1965, is often composed like a Norman Rockwell painting, but dotted with troubled faces rather than smiling snippets of white bread America. No young girl in a Rockwell painting ever wore as much eye shadow or toted around a portable record player with Franciose Hardy records like the troubled Suzy (Kara Hayward). He lives up to his promise in the tale of very young love. The idea behind the look was to capture an emotion or a memory that everyone can relate to. The search to create the ideal look for the island’s homes found Stockhausen exploring historic houses across the country and incorporating elements onto houses and sets on Rhode Island locations such as James­town, Prudence Island, and Middletown. Also on the list of inspirational homes was a sprawling historic location called Ten Chimneys in Wisconsin. It was once the home of Broadway legends Alfred Lunt and Lynne Fontanne. The house where the Bishops live was modeled after a few different houses. There was one called Clingstone in Narragansett Bay and another a converted lighthouse built in the late 1800s. “We just looked up reference after reference, and we started collecting everything from the big pieces down to the tiniest details,” he says. That attention to the whimsical, world-of-Anderson detail stretches to the osprey nests that are seen behind the movie’s narrator, Bob Balaban, as he introduces the geography of the island at the beginning of the film. Stockhausen says much of the film was developed around the terrain itself. They scouted woods and streams in the region to find locations that would be ideal for Sam (Jared Gilman) and Suzy’s journey. Sandy Hamilton’s prop decoration also was essential to Anderson’s vision of 1965 New England, including key accessories such as Suzy’s washed-out mustard suitcase, and the blue portable record player. The Trinity Church in Newport helped shape the way that Anderson staged the children’s performance of Benjamin Britten’s opera “Noye’s Fludde.” The tents for scout camp came from a vintage merchant who had held onto retro camping equipment, and Bruce Willis’s trailer was found in the South.